Born in Piacenza on August 7 1980, Renato Podestà started playing piano at age 8 and took up guitar at 12 years old, enamored by the first blues records he heard. He has performed, live and in the recording studio, with Umberto Petrin, Hetty Kate, Tricia Boutté, Kay Foster Jackson, Shanna Waterstown, Mattia Cigalini, Alfredo Ferrario, Massimo Greco, Sandro Gibellini, Beppe Di Benedetto, Gianluca Di Ienno, Marco Micheli, Michael Supnick and Stefania Rava, and with pop artists Renzo Arbore and Nina Zilli. In 2008 he cofounded the progressive swing band Sugarpie and the Candymen, where he has been working as a guitar player, arranger and vocalist. The band has recorded five albums so far, all for Italian indie label Irma Records, and has performed in jazz clubs e festivals around Europe, such as Umbria Jazz, Jazz Ascona, Madrid Jazz Festival, Offtown Festival (Istanbul), La Meridien Etoile (Paris) and many others, as well as several radio and TV shows in Italy, Switzerland and Poland. January 2019 saw the release of his first record as a leader, Foolish Little Dreams (IRMA Records). All About Jazz musician pages are maintained by musicians, publicists and trusted members like you. Interested? 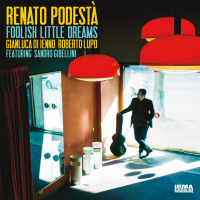 Tell us why you would like to improve the Renato Podestà musician page.